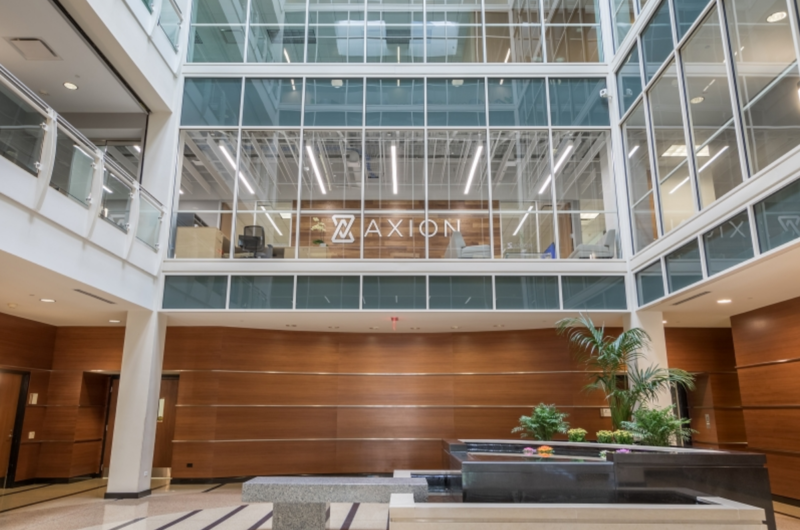 Axion RMS, a health insurance brokerage firm, recently relocated its corporate headquarters to Downers Grove, Illinois. Before a single employee could step foot into the new location, a massive overhaul took place. The resulting project turned the tired and dated third-generation space into a bright and spacious suite awash with natural light. 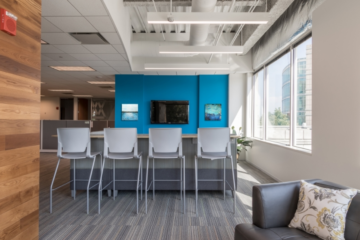 The flooring solution utilized a combination of Armstrong VCT, Mannington LVT and a variety of Milliken carpet tiles to maximize the design impact of the renovation and provide distinct spaces within the office. 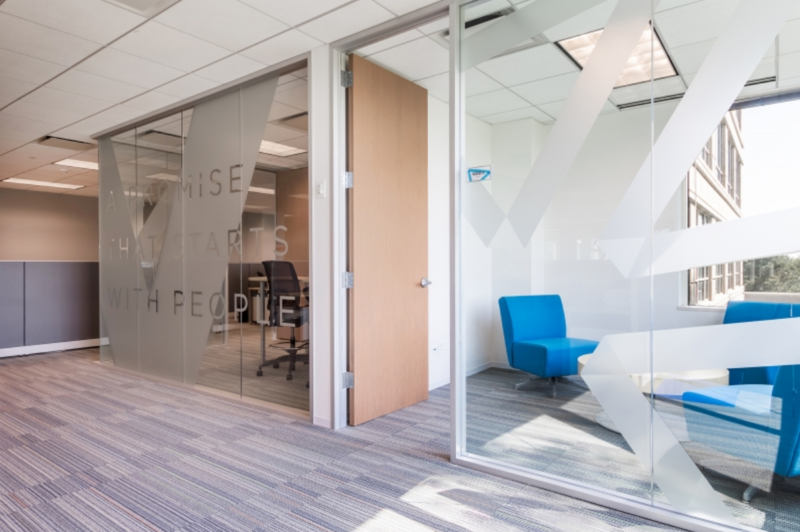 The design teams at INTERFORM Architecture + Design and INSTALL Warranty Contractor Vortex Commercial Flooring were presented with a space enclosed inside a perimeter of drywall offices. INTERFORM set out to transform the physical space; replacing the ceilings and adding more efficient lighting throughout. They also eliminated drop ceilings entirely in strategic locations. And, exposed structure and mechanical systems in the reception area, café and living room (a casual meeting area and respite for employees) were painted to give a modern and refined look. The result is a cleaner, loft-like feel with the living room and café located in former corner office locations. The design team strategically incorporated as much glass as they could, maximizing the natural light entering the space. The new layout also eliminated a number of perimeter offices to offer a balance between open workstations and private areas. The addition of small focus rooms, conference rooms and open workspace, provides both openness and a level of privacy. 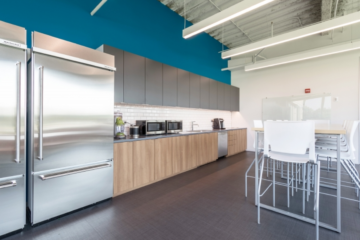 In addition to transformative physical changes, the flooring solution was a major consideration in the overall look and feel of the finished space. 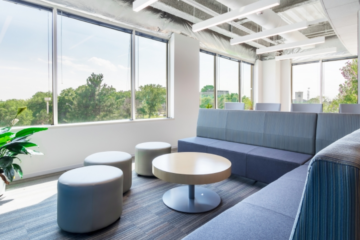 INTERFORM worked directly with Vortex to determine which products would maximize the design impact while providing a comfortable floor underfoot. The client also wanted to incorporate new colors and finishes that would coincide with updated branding and marketing materials. Specific accent colors and materials were requested that would create a modern aesthetic and adhere to a specific budget. To accomplish all of this, the design team selected a combination of LVT, VCT and carpet tile products from three manufacturers, along with hand painted bases to match specific paint colors. Milliken Remix 2.0 Mixtape Trimline 1m carpet tiles in four colorways were used throughout open offices, private offices, conference rooms and other communal spaces. To provide a durable yet design-forward alternative to carpet, Vortex recommended LVT from Mannington Commercial. Amtico Sedimentary Gray Stone in the reception area and Spacia Satin Weave in the café and work rooms provide a neutral yet luxurious floor that can stand up to high foot traffic, spills, and other wear and tear. Armstrong VCT was used in storage and server rooms to provide an affordable, long-lasting solution. As is typical with many corporate projects, the timeline to complete the Axion RMS HQ space was extremely limited. 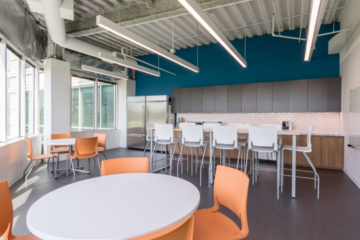 The company was required to vacate its previous space, leaving employees without office space until the project was complete. In addition, the project timeline for flooring installation fell over spring break for area schools. This small window of time is the only period when flooring contractors can work on education projects without displacing teachers and students. As a result, there was a labor shortage that could have potentially affected staffing and the final completion date of the project. Fortunately, INTERFORM and Vortex had worked together on many other projects in the past, and had formed a special relationship and understanding of industry challenges. 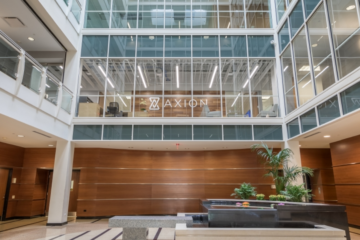 As an INSTALL Warranty Contractor, Vortex was also able to tap into the local labor pool and rearrange schedules to complete the Axion project on time. Of course, there were many other minor challenges throughout the process. The tight schedule and the fact that Vortex was the last trade in the space resulted in the need for the company to finish spaces during completion of the final project punch list. So, because there were several custom wall colors, Vortex was required to hand-paint bases to match several of the spaces. 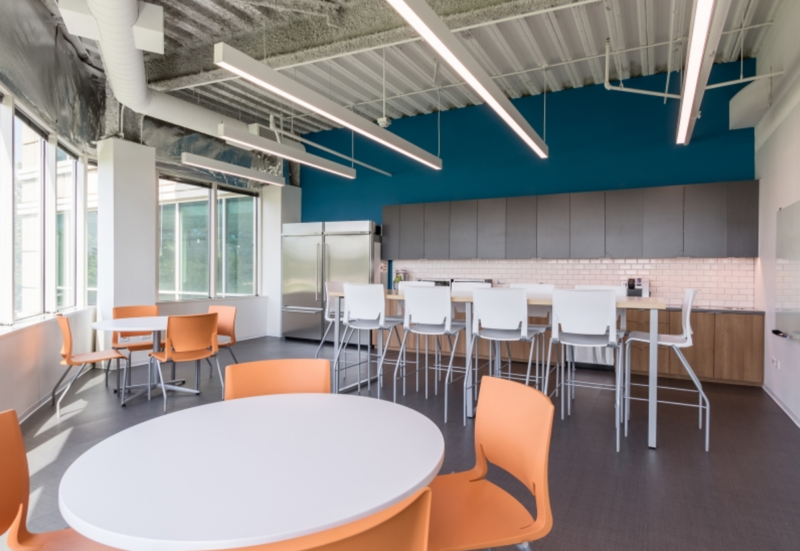 The resulting project is bright and flooded with natural light, elevating the firm’s culture – and boosting both production and employee morale. In concert with re-branding efforts undertaken by the firm, the same bright colors found on the walls and carpet accents were rolled out in marketing collateral materials. Despite a tight timeline, custom colors and a specific budget, the finished space was completed on time, on budget and to great fanfare. This is thanks in part to the expertise and dedication of the INSTALL certified team of journeymen from Vortex Commercial Flooring. From project management through execution, their talent ensured that no detail was overlooked. Plus, as an INSTALL Warranty Contractor, Vortex’s work is guaranteed by the only third-party, non-proprietary, free, extended installation warranty in the floorcovering industry. Additionally, the finished project has a low environmental impact with LED light fixtures on motion sensors, low VOC paints and adhesives throughout. The ultimate test was the project budget. To the delight of the client this build-out was completed at approximately 50% of the cost of other corporate interior jobs.